The late 2017 spike above the resistance trend line was also bullish, but the price has been unable to continue higher since then. We need to see gold climb through the 2018/2017 high at $1,365, the 2016 high at $1,377 and the 2015 high at $1,392 in order to turn bullish in the short term. This triple top is significant resistance for gold and the declining nature of the tops paints a bearish picture. So, it has been a waiting game for gold investors that prefer to harken back to the early 2000’s, when gold was in a powerful and fairly consistent uptrend from $250 to nearly $2,000. In the six and half years since that high, the gold price has corrected and consolidated, mostly in the $1,125 to $1,375 range. Long consolidations can be bullish, building a base from which the next advance is launched. And if gold can break through the resistance levels mentioned and climb decisively above $1,400, I think that we will see a very rapid race back towards the $2,000 level. The gold price has a strong inverse relationship with the U.S. dollar. During the massive gold bull market from 2002 to 2012, the dollar index corrected from around 120 to 72. The USD index bounced during the financial crisis of 2008/2009, as investors sold multiple assets classes and initially sought the safety of the dollar. The dollar then rebounded from 72 back above 100, causing the gold price to plummet. But it ran into resistance around the 100 level and has dropped significantly over the past 15 months to 88. The USD index fell through key support around 92, which was prior resistance. Dollar bulls would ideally like to see these prior resistance levels turn into support. But the 92 level failed and then the 89 level also failed briefly. The dollar is now at a critical inflection point, resting at the 2009/2010 resistance level at 89. This is also trend-line support as shown in the chart, making this support even more critical. The next major bull market in gold will be ignited by the USD falling below the current support level, which could happen at any moment. President Donald Trump named Larry Kudlow, the conservative media analyst who served as his informal economic adviser during the 2016 campaign, as the next head of the White House National Economic Council. The Trump administration has been mostly bearish for the dollar, stating that a weaker dollar is good for trade. All eyes will now be on the Federal Reserve meeting Wednesday, where FED chair Powell is widely expected to announce another rate hike. They are also likely to highlight strong economic data, which could be supportive of the dollar. Any hint that they may raise interest rates four times this year, rather than three, would certainly send the dollar higher and hurt the gold price. On the other side of trade is Russian President Vladimir Putin, who just won re-election in his country this week.Russia added 800,000 ounces of gold (24.88 tons) to reserves in February. 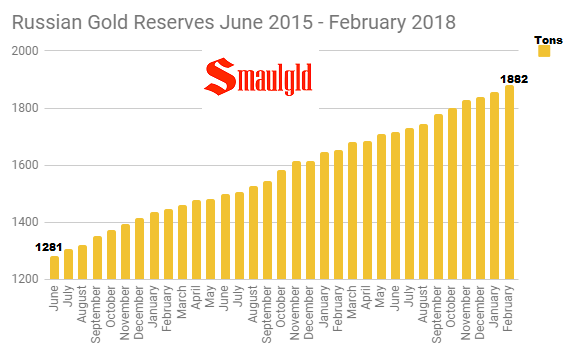 They added a record 224 tons of gold to reserves in 2017 and over 600 tons since June of 2015. Russian gold reserves at $806 billion are the fifth largest in the world and constitute 17.76% of overall Russian reserves. Meanwhile, Russia has been selling U.S. debt, with their holdings of U.S. Treasuries falling below $100 billion in January of this year. So, would you be better off following the advice of Larry Kudlow and selling gold or following the actions of Vladimir Putin and buying more during this dip? Kudlow worked for Bear Stearns, generated income from financial institutions that advertised on his show and has always aspired to political power. It is therefore not surprising that he would have a hatred of gold, as it is an asset class that his Wall Street buddies can’t make much money from. It is an asset class that has no third-party risk and continually highlights the flawed nature of the dollar and the entire fractional reserve fiat monetary system. He is a also a self-described “Reagan supply-sider”, but has no formal economics qualifications. A T.V. star with no economic qualifications seems like a good fit for the Trump administration, but probably not in the best interests of the American people. I guess only time will tell. Whatever you think of Putin’s policies, he is one of the most powerful men in the world and is also believed to be the wealthiest man in the world. According to Fortune, he has more money than Jeff Bezos and Bill Gates combined, at around $200 billion. Meanwhile, Kudlow is a TV personality with no formal economic credentials. He has been wrong about nearly everything on the economic front over the past decade, missing the biggest collapse since the Great Depression. Politics aside, I believe the smart money is accumulating gold, not U.S. dollars. And if the dollar slides lower in the months ahead and gold is able to finally take out $1,400, it will soon be very apparent which was the better investment. To get our monthly investment newsletter, model portfolio and trade alerts, become a premium member. You get can started for just $195.